It’s easy take cash for granted, isn’t it? You get it, you spend it, and in most cases, you never see it. Take a minute to think about the last time you used cash. For most, it’s probably been a while. Credit, debit and electronic or wire transfers from websites like PayPal, have made the cash option almost obsolete. Even physically going to a credit union or bank is unnecessary if your paycheck is direct deposited, which many companies now require. You look to your bank statement to track your wealth, but your actual cash is rarely seen, just some numbers on a page telling you what you’re worth. It’s almost futuristic, right? Perhaps we’ve finally arrived in the future, minus the jet packs and flying cars that we were promised. Back in the days of George Washington, physical currency meant more. Silver and gold were preferable to paper money. While attempts were made to implement the use of paper as early as the founding of the colonies, they proved relatively unsuccessful until the Civil War. According to NewMoney.gov, Congress authorized the U.S. Treasury to issue non-interest-bearing Demand Bills to fund the war. They subsequently received the nickname “greenback” because of their color. Today, all U.S. currency issued since 1861 remains valid and redeemable at full face value. So, although it might seem fitting to have Abraham Lincoln as the main face of currency given the time paper money took hold, it’s still Mr. Washington who graces the dollar bill. It might seem more fitting that a website with Washington’s name and image can track where all of those greenbacks have traveled, some as far as 5,000 miles or more. But with physical currency becoming all but obsolete with the convenience of online banking and mobile apps, how do you really track your money? Checking and savings accounts have been the norm for years, but with the ever-growing popularity of mobile banking, does physical cash even stand a chance? Not only that, but using cash also can actually cost you more. According to research from Tufts University, cash costs U.S. consumers, businesses and governments more than $200 billion annually in everything from ATM fees and theft to lost tax revenue. It also found that the cost of cash is higher for the poor and those who don’t use banks. Poor Americans who lack access to financial institutions carry larger amounts of cash and pay the most in fees for access to cash transactions. However, Americans who use financial institutions report that they carry less cash and pay fewer, if any, fees. So why have we moved to online banking? First, it is convenient. It’s so easy to grab your smartphone, launch your mobile app, take a photo of that check and deposit it all from the comfort of your couch. But do you know the history of online banking? You might be surprised to learn it started in the early 1980s. In 1983, the Bank of Scotland started offering customers of the Nottingham Building Society the first Internet banking service called Homelink, which allowed customers via TV and telephone to send transfers and pay bills. Homelink formed the foundation for online banking we know today. By December 2001, eight U.S. banks had millions of online users, with 19 million U.S. households accessing bank accounts online. In 2011, online banking was firmly in the mainstream. If the use of physical currency is fading, how will we measure liquidity down the road? 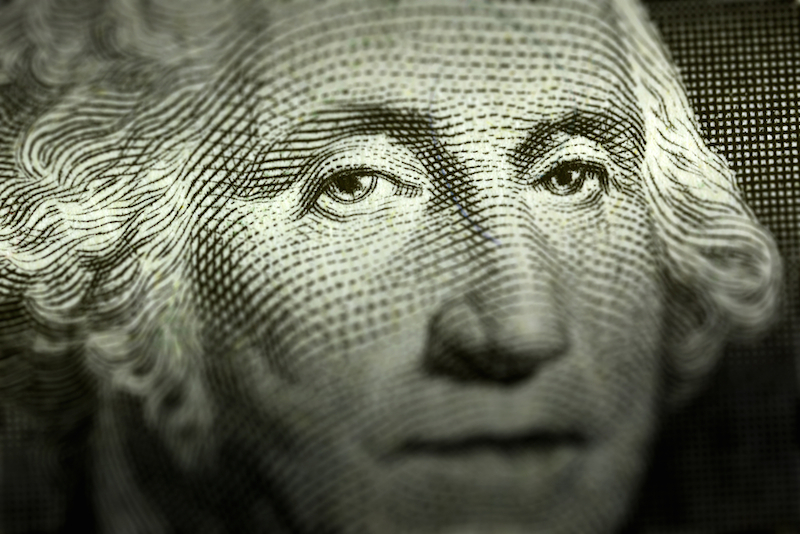 Image of George Washington’s face on a dollar bill via Shutterstock.